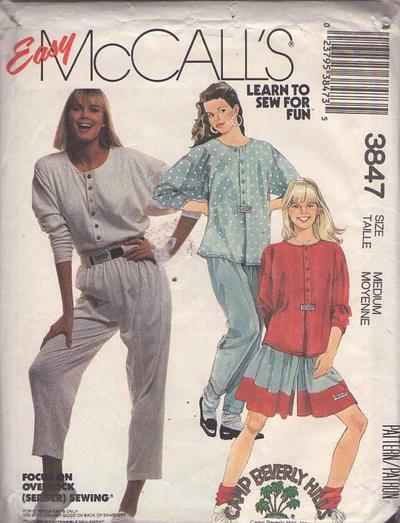 ​Bust 36-38", Waist 28-30", Hips 38-40"
1988, 80s Valley Girl, Retro Beginners Clothing Patterns - Pullover top with front button and pleat has long sleeves with underarm gussets. Pants with front and back seams has elastic in waistline casing and elastic belt with carriers. Pull-on shorts with contrast bands has front and back pleats and elastic in waistline casing. A Camp Beverly Hills design!